Facebook is reportedly planning a massive new business initiative that could eventually drive billions of dollars in advertising revenue. During the first half of this year, the company plans to sell ads within its Messenger application, which has 800 million monthly active users (MAU), according to TechCrunch. Such a move wouldn't be the first time Facebook sold ads outside of its core social networking app, but it would represent the largest audience (outside of the Facebook app's user base) that the company has made available to advertisers. Facebook has consistently increased the number of ads shown in Instagram, a visual social network with 400 million MAUs, during the last year, and it sells automated in-app mobile video and display ads to publishers via its LiveRail platform. In October, Facebook COO Sheryl Sandberg said the company was in the "very early experimentation stage" of placing ads in Messenger, when she spoke about the effort during the Advertising Week conference in New York. However, Facebook declined to comment on TechCrunch's recent report. Messenger ads would give marketers a new channel to create more personalized relationships between companies and consumers, but the ads could also represent a challenge for Facebook, according to Amber Whiteman, vice president of digital marketing agency Metia. "If the advertisers don't take advantage of the unique medium and tailor their ads specifically, it could easily fail and consumers won't be as receptive to another platform trying something similar in the future," she says. The context in which ad are shown in Messenger would largely determine how users react to them, according to Seth Shafer, research analyst at SNL Kagan. "While there might be backlash to ads showing up on personal messages, users might react differently to an offer from Uber for 20 percent off their next ride if they'd previously used Messenger to book an Uber ride." Facebook will allow businesses to send ads in the form of messages only to users who previously communicated with the companies on Messenger, according to a document obtained by TechCrunch. 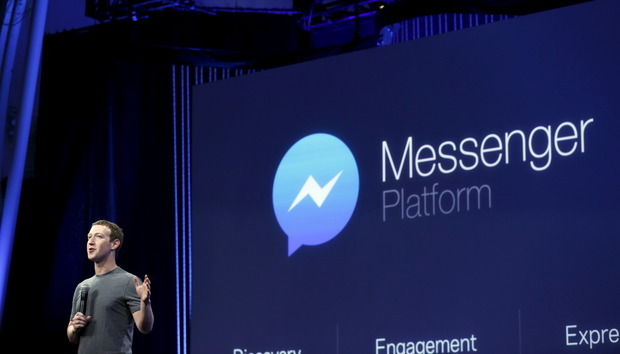 Users would have to contact businesses directly on Messenger before the companies could send them ads, according to the TechCrunch report. "This new platform is unique in that it is choice-driven," Whiteman says. "Allowing Facebook users to initiate the conversation in the first place makes them much more receptive to the ads once they engage." Snapchat's approach to advertising could be a "potential analog to what Facebook might do with ads on Messenger," Shafer says. "Snapchat has been careful to only present ads outside of the core Snapchat service," such as video ads in Snapchat Discover and sponsored ad formats that display in other sections of the app. "Facebook would likely be very hesitant to include ads directly in person-to-person messages on Messenger but including ads on consumer-to-business communications could very well be a possibility — especially if the consumer has already initiated contact with the business on Messenger," he says. When Facebook first introduced ads on its platform in 2004, the site had fewer than one million users. The company's user base today is 1.59 billion MAUs, and its ad business drove $5.6 billion in revenue during the fourth quarter of 2015. Advertising on Messenger could also drive meaningful ad growth for Facebook, considering the company's proven ability to reach consumers at scale with targeted advertising, according to Shafer. If Messenger ads prove to help businesses increase sales with existing customers, brands would flock to the platform, thereby creating a scarcity of inventory and higher prices, he says. Whiteman also sees the potential for increased ad costs "because of the intimate relationship the ads create between brands and single consumers." The level of execution will largely depend on advertisers' ability to be creative with the medium, but if they are, Messenger ads "just may become the app's main money maker," she says. « What keeps white hat hackers from turning to the dark side?